This paper explains the Crossrail approach to and process for undertaking environmental assessments to accompany planning applications made for Oversite Development (OSD). The legal context for carrying out EIA for Crossrail OSD is explained with reference to Section 14 of the Crossrail Act (2008) and the methodology and criteria used for the assessments are set out, in particular providing clarification relating to the baseline for the OSD assessment and its relationship to the Crossrail works. Some examples of the approaches taken to various baseline scenarios are presented. The Crossrail Act (subsequently referred to in this document as the “Act”) grants powers for the works which relate to the construction and operation of the railway but does not provide for replacement buildings above or around the operational stations and structures (known as Over Site Development (OSD)), which are subject to the normal planning process (i.e. they require a planning application to be determined by the appropriate local planning authority in accordance with the Planning Acts). Section 14 of the Act contains provisions that modify the Town and Country Planning (Environmental Impact Assessment) (England and Wales) Regulations 1999 (SI No. 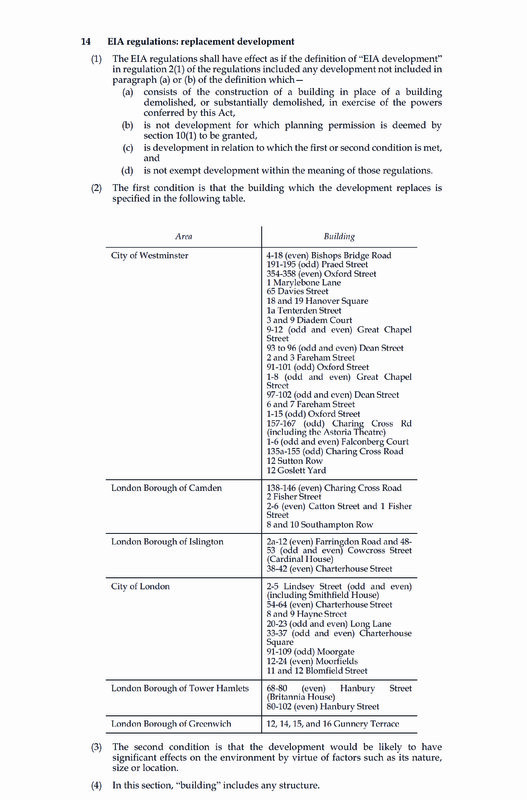 293) as amended (referred to subsequently as the ‘EIA Regulations’) such that, in specific locations, where a building is demolished or substantially demolished for the purposes of the Crossrail works, any later planning application for OSD must be accompanied by an environmental assessment (regardless of the criteria and thresholds in the EIA Regulations e.g. relating to the size of the development). The need for Section 14 derived from the principle that OSD forms part of the overall Crossrail project, but it was not sufficiently defined at the parliamentary phase of the project for powers to be included for it in the Crossrail Bill or for it to be assessed in detail in the Crossrail Environmental Statement (ES). The purpose of Section 14 was to therefore to ensure that all the direct and indirect environmental effects of the development authorised by the Act were properly assessed and reported at the appropriate stage. In summary, Section 14 of the Act requires EIA to be undertaken for OSD at the specified sites (see extract from Section 14 of the Act in Appendix 1), irrespective of whether the OSD would otherwise be qualifying development (under the EIA Regulations) and whether or not it would have significant environmental impacts in its own right. For sites not listed in Section 14, an EIA is only required for Crossrail-related OSD where the local planning authority determines that such development is likely to have significant environmental impacts. Given the need to assess cumulative impacts between the Crossrail development and the OSD, the same assessment scope, methodologies and criteria were applied to the OSD EIA as were used for the Crossrail EIA. Volumes 1 (Chapter 3), 5 and 8 of the Crossrail ES provide full details of the methodologies and criteria but the key principles relevant to the OSD assessment are highlighted below. The scope of the OSD EIA included all works (including enabling and advanced works) related to the construction and operation of the OSD which were not assessed in the Crossrail ES. It also included assessment of any change in impacts from the project i.e. changes in the impacts due to Crossrail resulting from the presence of the OSD. The EIA Regulations require an ES to clearly define the baseline conditions against which the environmental impacts are assessed and that a baseline be used that ‘recognises changes to conditions at the site and conditions ‘projected forward’ to take account of all ‘committed development’ and ‘…taking place over time without specific intervention’. The site following completion of the Crossrail works but prior to commencement of the OSD. The appropriate baseline varied between the construction and operational assessments and, for each environmental topic, as determined by considering the timing of the OSD compared with the Crossrail works. In all cases, a ‘common sense’ approach was taken to present decision makers with the most accurate assessment of impacts as practicable. Construction impacts were assessed against the baseline conditions that were predicted to occur at the site at the time of OSD construction. Where there was a reasonably foreseeable overlap in the construction programmes for the Crossrail and the OSD works, the ES addressed cumulative impacts. The baseline against which operational impacts were assessed was the ‘pre-Crossrail’ conditions. By taking this approach, the impacts of the development authorised by the Act were reported. Townscape: In some locations the Crossrail ES reported permanent significant residual townscape impacts associated with the completed station structure. 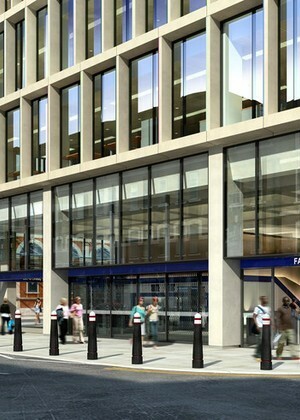 However, the subsequent development of the OSD was highlighted in the Crossrail ES as a likely positive impact in townscape terms, serving to ‘reinstate’ elements of townscape which were removed as part of the station development and reduce the residual impacts reported in the Crossrail ES. The townscape assessment for the ‘operational OSD considered the significance of the impact of development of the OSD in its own right and the significance of the change from the pre-Crossrail townscape to the post-OSD townscape. In doing so, the OSD ES reports the residual impacts from the station development and OSD combined, and confirms the beneficial impact of the OSD in townscape terms, as referred to in the Crossrail ES. Fixed plant noise: Crossrail was required via assurances given during the Parliamentary process to meet certain requirements of Information Paper D25 – Noise from Fixed Installations (IPD25) to control the effects of noise and vibration from the operation of fixed installations designed and installed as part of Crossrail. The IPD25 design criterion require airborne noise arising from fixed installations, as determined for the worst-affected residential building by subtracting the existing background noise level (LA90,T) from the rating level of the fixed installations in normal operation to be no more than +5 dB (assessed in accordance with BS 4142:1997). Given the OSDs sit above the Crossrail structures, often sharing the same structural envelope, the impact of fixed plant noise associated with the OSD could not be considered in isolation. At the time of the OSD EIA, the fixed plant required for Crossrail was not installed, therefore it was impossible to measure the background noise against which to assess the impact of the OSD. As a result, although the IPD25 assurances do not apply to the OSD, the fixed noise assessment for the ‘Operational OSD’ considered the combined plant noise from the station and OSD. In doing so, the OSD ES reported any beneficial impact of the OSD building (i.e. in acting as a noise barrier) and reducing the operational impact of Crossrail. The IPD25 methodology was employed to assess the combined impact at the same set of receptors as assessed in the Crossrail ES and against the pre-Crossrail background noise levels (unless otherwise agreed with the local authority in accordance with the process set out in IPD25). In accordance with the Crossrail ES assessment methodology, the impact reported in the OSD ES was not significant if the cumulative noise of the fixed installations is no more than +5 dB. In order to manage OSD EIA consistently across the project, a guidance note was produced for the Crossrail team which explained the process for the production and review of the OSD ES and provided confirmation of roles and responsibilities and timescales for review and approvals. Any project which needs to similarly allow for environmental impact assessment of development not authorised as part of the main legislation will need to follow a similar process. Information sharing between the OSD design/EIA team and Crossrail station design and construction teams is critical to ensure that the scope of potential cumulative impacts is fully understood and that the assessment can be undertaken robustly. Changes to station designs (in particular relating to the detailed design of mechanical equipment e.g. ventilation shafts) have an impact on the combined OSD assessments, so station design programmes need to be co-ordinated with the consents programme for the OSD. A significant resource was required to undertake the OSD EIAs and support was required from the Crossrail team to ensure the OSD EIA teams were fully appraised of the Crossrail methodologies and criteria. 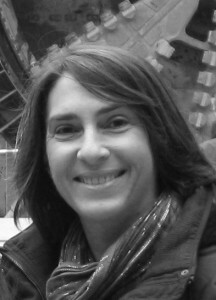 Claire is an environmental professional with a postgraduate specialism in Environmental Impact Assessment and 16 years’ experience relating to the appraisal, planning, design and construction of major transport infrastructure projects. During the delivery phase of the project, her responsibilities changed to assuring compliance of procurement, design and construction outputs with Crossrail’s Environmental Minimum Requirements (EMR) and Environmental Management System.